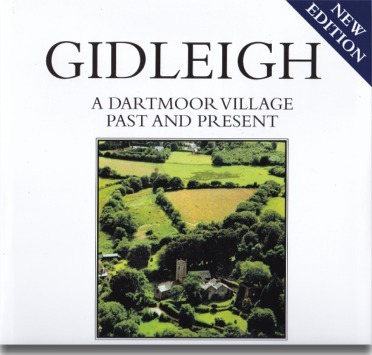 Whenever doing any research on Gidleigh and its surrounding area I always used to consult the ‘Gidleigh – A Dartmoor Village Past and Present’ book. This was jointly written by Tony Grumley-Grennan and Michael Hardy and published in 2000. Then sometime ago I went to find my copy and to my dismay it was nowhere to be found. As this was an integral part of my Dartmoor library I went in search of another copy. The first stop being Amazon but to my dismay the ‘currently unavailable’ box came up. OK, next step try a second-hand bookshop so Abe Books – nothing, Ebay, – nothing, and every other link led back to Amazon. Distraught or what? it was like losing one of the family. Then a week or two ago I received an email from Emma Stockley of the ‘Moor Than Meets the Eye‘ project asking if I would like to review the new edition of the ‘Gidleigh – A Dartmoor Village Past and present’ book. The re-publishing of the book was a Gidleigh Parishscapes project which was funded by the ‘Moor Than Meets the Eye‘ and the Heritage Fund. So what’s new? Along with retaining much of the wealth of information contained in the original version there have been appropriate revisions. As always fresh information comes along and this edition has been furnished with such new and updated facts. These particularly apply to events that took place during the 17th and 19th centuries. Examples being population figures, new information on the church, the various properties and people in and around Gidleigh, farming and land use to name but a few.. Whilst retaining many of the delightful photographs taken by Chris Chapman and the building illustrations there are a couple of new ones. It is amazing the number of changes that have taken place in this small Dartmoor village over the past 19 years all of which have been reflected in this new edition. Thankfully the index has been retained along with the bibliography which includes many of the new recent resources that have become available. Where in Gidleigh did the author Eric Hemery live? How did Donkey’s Corner get its name? What was a ‘bacon settle’? Who was the reverend that was strong enough to lift a car single handed out of a ditch? Who breeds and trains gun dogs at Gidleigh? How did Gidleigh’s place-name come about? Do you know? if not then there is the perfect reason for buying this book. If you do know then there is still no reason for not buying this book. To the best of my knowledge ‘Gidleigh – A Dartmoor Village Past and Present’ is the only publication available on the subject of Gidleigh. This book will soon become a worthy addition to any Dartmoor library and one that I can thoroughly recommend. Finally when I first purchased my 2000 copy it cost me £20 so imagine my surprise to see that the 2019 edition costs exactly the same. Have I any criticisms about the book? possibly a bit more archaeological detail could have been included? For information about where you can purchase your copy please contact Emma Stockley at emma@moorthanmeetstheeye.org. Gidleigh – A Dartmoor Village Past and Present.